Special Shipping Rates Apply to This Product. This product does not quality for any FREE SHIPPING discounts. Looking to change up your swimming workout regimen? Fins can add a new dynamic to your time in the pool by adding another element to your stroke. 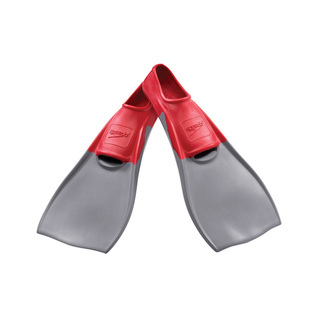 Swimmers of all levels of experience will benefit from using fins to strengthen their legs, improve their posture in the water, and increase their speed for race day. You can even incorporate them into swimming classes, training for a triathlon, or simply a day of fun at the beach. Please be aware: each size correlates to a specific color. For example, all fins sized medium are blue, all larges are red, etc. The size you need will dictate what color you receive. We cannot exchange items for color, only size. Good material and nice fit. The fin is just the right thickness to be flexible yet provides force when you kick. Nice fins but they do not float. Much easier to use (and lighter) than the SCUBA fins I purchased 20 years ago. Better than the ones he was using for swimming lessons. I prefer the longer length of these fins.